Password, or pass phrase, passcode, or PIN (personal identification number) has been used prominently during daily life to access to certain resources such as Windows accounts, password protect files, websites’ log-ins and locks’ combination numbers. If you forget or misplace your master combination lock number, you can try to crack the combination lock to retrieve and get back the combination number by following the instructions and steps in the following video tutorial guide. 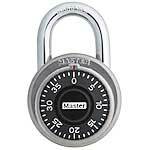 The combination cracking guide should works on Master lock, although some of the techniques can also be applied to other manufacturers’ locks, such as ACE Hardware, American and Dudley brands of combination locks. The steps are plenty, and involves some math calculation, and might take your few hours to crack and hack to recover the master lock combination number. It might be quicker to simply buy a bolt cutters. For more information on how a combination lock works and why these techniques work, plus pictures of the inside of a combination lock, visit here.